What many people like about recoil-operated “inertia” shotguns is the very low maintenance. What folks don't particularly love is paying $1700 or more for a very cheap to produce plastic shotgun, even if it supposed to be made of highly polished plastic by old world craftsmen. Now that the Bruno Civolani patents, originally purchased by Benelli then acquired by Beretta when Beretta acquired Benelli, have run . .. anyone who wants to make an inertia gun can do so, without licensing fees or legal entanglements. The firearms industry is doing just that. As a result of the greatly increased competition, inertia guns are now more affordable than ever before. Here is a look at several inertia guns that are worthy of your consideration in 12 gauge, 3 inch chamber trim. 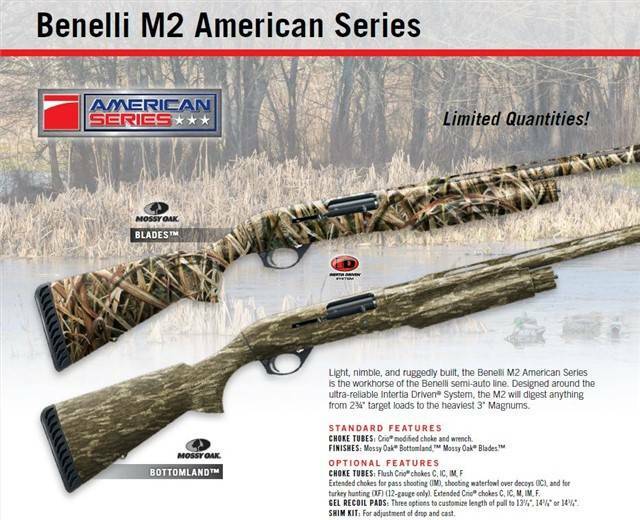 The recently introduced Benelli American M2 sneaks in at just under $1000, often discount priced at $949 - $999. It is the stripper version of the M2, coming in a cardboard box with just one choke tube. It doesn't have the Comfortech stock, but instead has a conventional, less flexible thermoplastic stock in its place along with a cheaper recoil pad. No shims are supplied. It does lower the price by $300 - $400 as compared to the standard M2 Comfortech models, a substantial amount, so if you like the way it fits you, it is worth a look. Made by ATA of Turkey, the Weatherby Element Waterfowler in 12 gauge can be had for a low as $630 or so. While most synthetic inertia guns are right at seven pounds, the Weatherby as tested is a bit heavier than most at 7-1/4 lbs. Made at the Benelli facility in Urbino, the newest Franchi Affinity 3 has a larger charging handle and a bigger bolt release than the original Affinity. Why this minor change is called a redesign is anyone's guess, but the several Affinity models I've tested have been solid performers. The Masai Mara is the newest to the American market, having just been imported since September, 2017. It is easily the best-presented of this group, with a locking hard case, five choke tubes, shims, a snap cap, and so forth. Warranty work, if needed, is handled by Briley. If low initial purchase price is your primary goal, the Weatherby Element wins. It is about a quarter pound heavier than the others, but has what I feel is the best stock feel: Weatherby's “Griptonite” layer of rubber over the thermoplastic stock. The Weatherby is not perfect, though, as the trigger is on the heavy side, the safety is on the extremely dinky side, and the curved recoil pad is not the best, nor is it easy to replace. The Weatherby is covered in more detail here: http://www.randywakeman.com/WeatherbyElement12gaInertiaAutoloader.html . The Retay Masai Mara is the best-built of these four shotguns, with a machined alloy trigger group and alloy trigger guard . . . all of the other guns are plastic in these areas, with visible mold lines. The Masai Mara has one particularly unique feature, the push button quick release trigger guard that swings right out. The MM has a better recoil pad than the rest of the crop as well: it does not have a wacky profile like the Franchi pad, or the curved profile of the Weatherby, and is easy to replace with aftermarket as a result. The lowest-priced shotgun of these four models is not a matter of opinion: the Weatherby Element clearly is the bargain of the batch. It is essentially the ATA Neo, but with Weatherby's added quality control, Weatherby has added their Griptonite rubber-paneled stock, and the Element takes standard Browning Invector style choke tubes. My gripes are with the very small, triangular safety and the non-standard, curved, essentially solid recoil pad. Despite the minor niggles, the Weatherby Element is a desirable, perfectly reliable shotgun, and the price is attention-getting. The Franchi Affinity is essentially the Stoeger version of the inertia action, with the mainspring under the forearm, around the magazine tube . . . not in the buttstock. Pre-Affinity, it was the Franchi I-12, the examples that I'm familiar with were extremely crude, had bolt handles that didn't like to stay in place, and extractor problems as well. The Affinity takes care of the I-12 reliability problems, but still retains the strangely cut “TSA” pad that is not particularly good and can be a real headache to attempt to replace. The current Affinity 3 is a minor variation of the Affinity: the familiar larger charging handle, bigger bolt release, slightly larger loading port routine. The Affinity takes the common and popular Beretta Mobil-chokes. The Affinity is a good gun: if they would get rid of the absurd TSA pad, it would have far more appeal. Still, for a Beretta family inertia gun, it is the best value currently available. The Retay Arms Masai Mara is the new kid on the block. The choke tube system is Retay's version of the Benelli Crio Plus choke tubes, but Crio Plus choke tubes will not fit. Trulock choke tubes is expected to have aftermarket choke tubes available in short order. Since the “MaraChoke” is not common, it is a good thing that the Masai Mara comes complete with five chokes tubes in its lockable hard case. Synthetic stocked models start at $799 MSRP and their “luxury walnut” models start at $990 MSRP. Retay Arms is based in Turkey and they do the metalwork and machining. The parts that they source are all from high-end, mostly Italian vendors: Minelli stocks, Cervellati recoil pads, and Megaline hard cases. This is a bit unusual, for many imported shotguns tend to use whoever is cheapest that month or that week. What stands out with Retay, compared to the rest of the sub-thousand dollar inertia guns cited here, is that only Retay packages their shotguns well, in custom Megaline hard case, where everyone else just stuffs cardboard boxes. Your chances of getting a truly pristine Masai Mara are quite good, while many of the new guns I test have at least a bit of box rash and light scuffing. What seals the deal for some folks is the push-button, quick release, machined trigger group. It makes full cleaning in the field easy, with no pins or springs to lose. The Masai Mara also has a machined, removable ejector that Retay is proud of, although ejector problems with any of the models discussed here are rare. Although the safety button is not as tiny as the little triangular affair of the Weatherby, the round Masai Mara safety could use some enlarging as far as I'm concerned. There is about a $200 MSRP spread in retail price between the basic black thermoplastic stocked guns and the walnut models. The oiled finished walnut stocks are exceptional, so if you are a well-figured walnut fan the oiled walnut models are going to be hard for you to pass up. The walnut model I tested is ¼ lighter than the synthetic camo at 6-3/4 lbs. For the upland hunter, lighter weight and walnut is an excellent combination. I wouldn't have a problem hunting with any of these four shotguns. In terms of low price, the Weatherby element in black synthetic (not camo) has a street price of $550 and that is a bargain no matter how you look at it. In terms of the complete package, with all the included bells and whistles, the Masai Mara is the most satisfying, and even though the oil-finished walnut Masai Mara models are not the cheapest in the Masai Mara line, they are the best-looking inertia guns in the thousand dollar and under category.